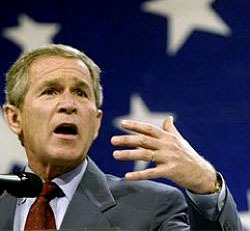 After the 2003 call, the puzzled French leader didn’t comply with Bush’s request. Instead, his staff asked Thomas Romer, a theologian at the University of Lausanne, to analyze the weird appeal. ….In 2007, Dr. Romer recounted Bush’s strange behavior in Lausanne University’s review, Allez Savoir….Subsequently, ex-President Chirac confirmed the nutty event in a long interview with French journalist Jean-Claude Maurice, who tells the tale in his new book, Si Vous le Répétez, Je Démentirai (If You Repeat it, I Will Deny), released in March by the publisher Plon. This isn’t brand new: the Toronto Star wrote about it a couple of months ago, though it’s gotten very little attention since. In any case, consider it your weirdness of the day. Not that we’ve exactly been lacking for that lately…..